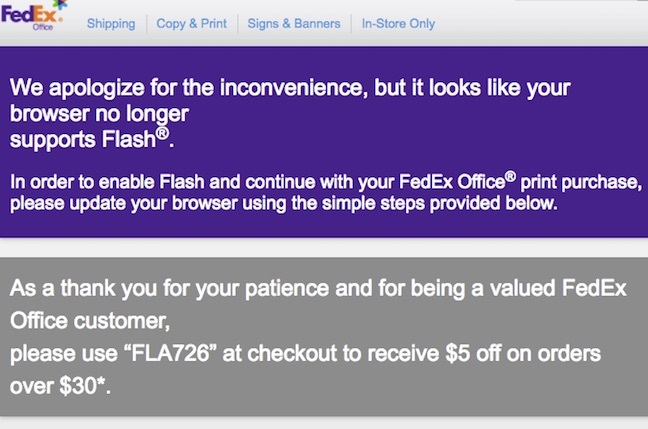 FedEx is offering customers US$5 to enable Adobe Flash in their browsers. But the web-based config-o-tronic widgets that let you whip and order those masterpieces requires Adobe Flash, the enemy of anyone interested in security and browser stability. And by anyone we mean Google, which with Chrome 56 will only load Flash if users say they want to use it, and Microsoft which will stop supporting Flash in its Edge browser when the Windows 10 Creators Update debuts. Mozilla's Firefox will still run Flash, but not for long. The impact of all that Flash hate is clearly that people are showing up at FedEx Office Print without the putrid plug-in. But seeing as they can't use the service without it, FedEx has to make the offer depicted above or visible online here. That page offers a link to download Flash, which is both a good and a bad idea. The good is that the link goes to the latest version of Flash, which includes years' worth of bug fixes. The bad is that Flash has needed bug fixes for years and a steady drip of newly-detected problems means there's no guarantee the software's woes have ended. Scoring yourself a $5 discount could therefore cost you plenty in future.